This was for Katy’s sketch challenge on Docrafts, and I was well out of my comfort zone – I’m really not sure about Kraft card but it matched the robin so I stuck with it! 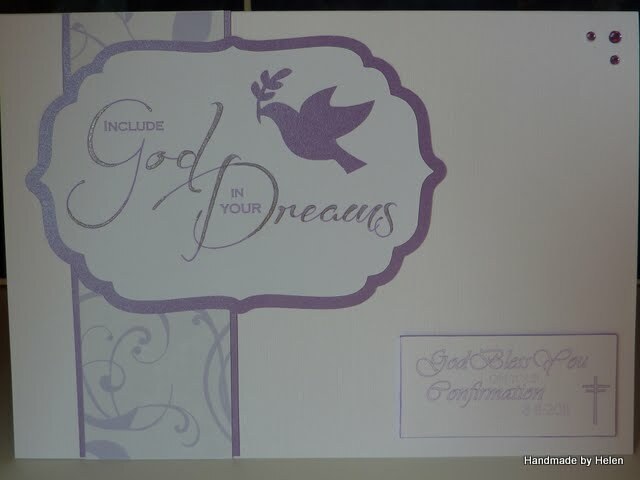 Since I made the confirmation card I found that Serif Page Plus is easier for creating word art than Picasa so this is the first card I’ve made using that. This is for the newest member of my extended family. Snowflakes – cut on my Craft Robo Lite, then heat embossed in white and finished with silver Stickles. Backing paper – free from here then cut on my Robo. Word art produced using Serif Page Plus. Cotton border: coloured using Burnt Orange Promarker. I made this card recently at the request of my sister, who had been asked to be a sponsor for a teenage girl who was being confirmed. The theme of the confirmation was “Include God in your Dreams” so I was asked if I could incorporate that phrase somehow. That almost had me defeated! I knew I wanted to create word art but I didn’t know how, until I saw this blog which showed how to use Picasa to do more than just store & edit photos. I printed the word art then filled some of the spaces in the letters with a Sakura Stardust pen in silver. With that done, finishing the card was easy – a dove cut on my Craft Robo Lite, some elegant Pink Petticoat backing paper layered onto satin paper & flat-backed jewels to finish.